Applying Dental Sealants is a simple procedure in which a tooth-colored acrylic coating is painted onto the surface of the tooth. This effectively seals deep grooves, protecting enamel from plaque and acids. Easy to apply, sealants take only a few minutes to seal each tooth. 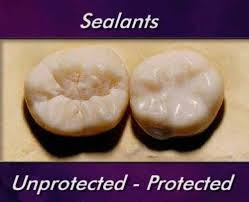 Sealants hold up well to normal chewing and can last several years before a reapplication is needed.